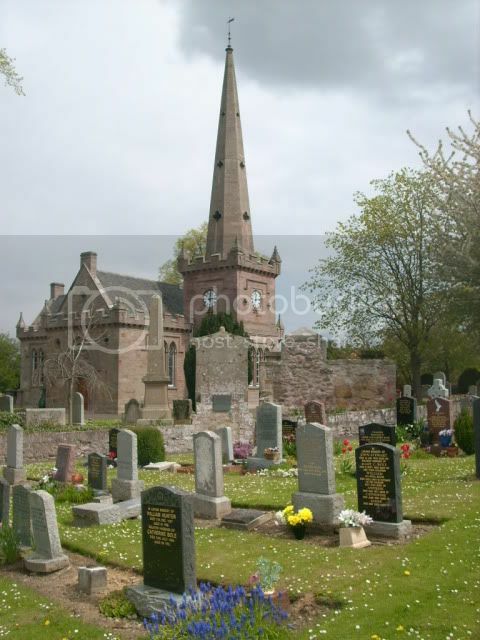 Saltoun Church and churchyard can be found in the village of East Saltoun, which lies on the B6355 and connects it to Gifford in the east, and Pencaitland in the north-west. A former branch railway line which linked East and West Saltoun to Gifford, Haddington and ultimately Edinburgh was closed to passengers in 1933 and is now a cycle path. East Saltoun and West Saltoun are separate villages in East Lothian, Scotland, about 5 miles (8 kilometres) south-west of Haddington and 20 miles (32 kilometres) east of Edinburgh. The villages of East Saltoun and West Saltoun, together with a large number of farms and hamlets, form the rural and mainly agriculture parish of Saltoun. The two villages lie in the foothills of the Lammermuirs, and are separated from each other by about one mile. To the south the villages are largely bordered by woodland: Petersmuir Wood, Dryden, and Saltoun Big Wood. In the 12th century David I gifted lands in Saltoun to Hugh de Moreville. In 1643 the lands and barony were sold to Andrew Fletcher (grandfather of Andrew Fletcher, the Patriot), and it was the Fletcher family who attempted to make Saltoun a centre of manufacturing in the early 18th century. Most industry was sited in West Saltoun (formerly Milton), on the Birns Water. The first barley mill in Scotland was established there in 1712, and the British Linen Company had bleachfields in West Saltoun in 1746. In the early 19th century the Fletcher family invested further in the parish by helping to pay for a new church, manse and school in East Saltoun, and commissioning additions to Saltoun Hall (near West Saltoun). By the mid 19th century most of the parish's industries were failing, and the land was given over to agriculture. East Saltoun (once known as Kirkton) is the larger of the two villages. A church dedicated to Saint Michael was first consecrated in 1244, and several church buildings have been used since then. Gilbert Burnet, theologian and Bishop of Salisbury, started his ministry in Saltoun in 1665. 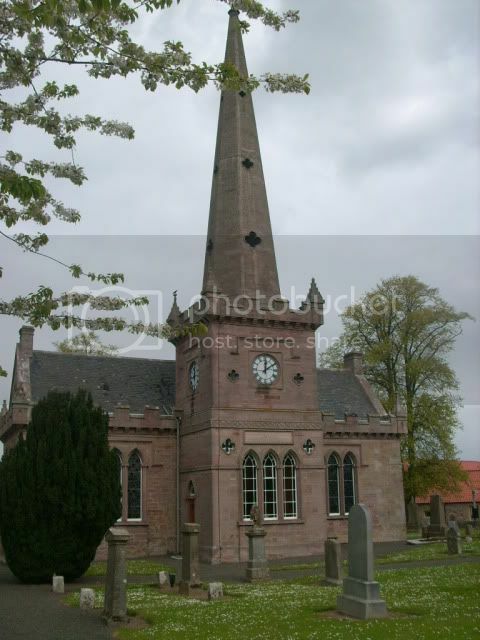 The present building dates back to 1805, and is built in the shape of a cross with a Gothic-style tower and steeple. Local facilities include a garage, shop, village hall, blacksmith, and school. 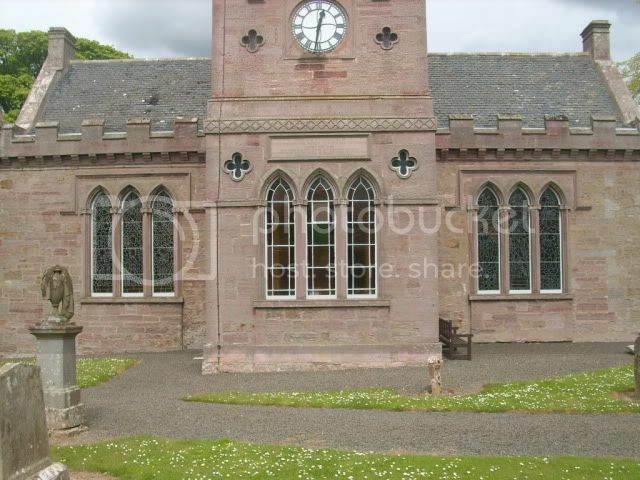 The school serves East Saltoun and West Saltoun, as well as the wider parish, and as of 2008 the roll was 49. At one time West Saltoun was larger, and had its own school, post office, and shop. Today, West Saltoun is smaller and is made up of just a few houses, with Saltoun Big Wood and the Birns Water nearby. There is only one CWGC grave with in this churchyard, but there are several family military graves. 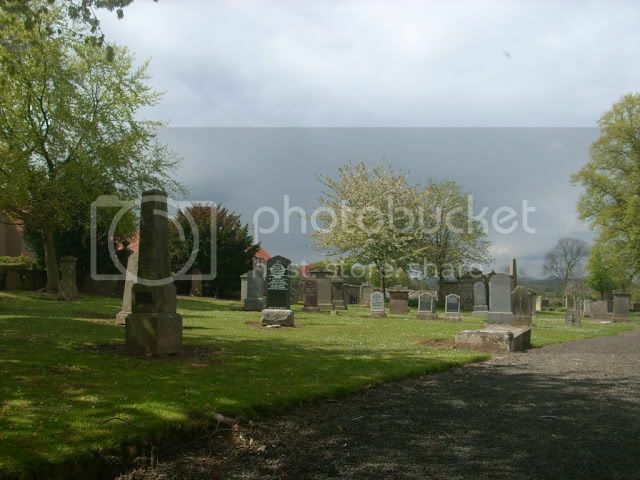 Saltoun Parish Church is a church in East Saltoun, East Lothian, Scotland. It is part of the Church of Scotland, and (along with Bolton Parish Church) serves the parish of Bolton and Saltoun, which includes the villages of Bolton, East Saltoun and West Saltoun. The church lies in the centre of the village. 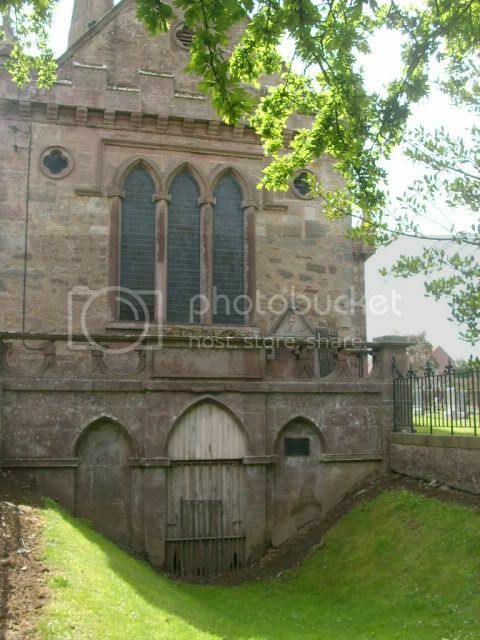 The first church in Saltoun Parish was built in 1244 by the Bishop of St Andrews, and was dedicated to Saint Michael. During the brief establishment of Episcopacy in Scotland in 1633, the church (and the control of electing a minister) was transferred to the Bishop of Edinburgh, before being passed to Andrew Fletcher (the local land-owner) in 1643. Gilbert Burnet (later the Bishop of Salisbury) started his ministry at Saltoun in 1665. During his five years there, he enlarged the church. He left in 1669 to become Professor of Divinity at Glasgow University and, later, Bishop of Salisbury. 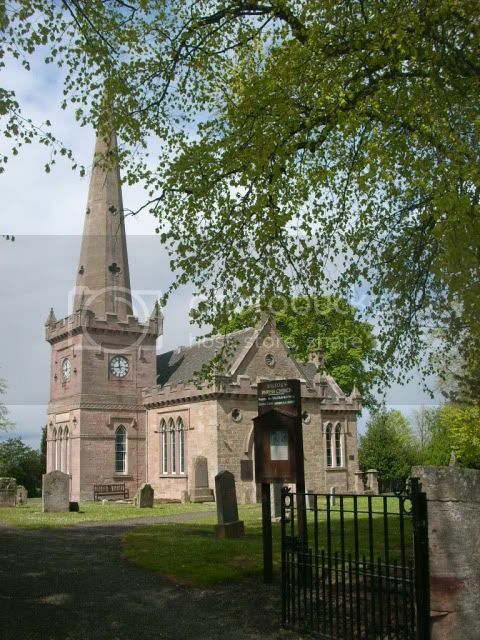 The present church building was built in 1805, probably by the architect Robert Burn. The church is crucifrom in shape, with the vestry and steeple occupying the eastern arm. In 1929 the parishes of Bolton and Saltoun were united, and in 1970 the parish was linked (but not united) with Humbie to the south and Yester (Gifford) to the east. 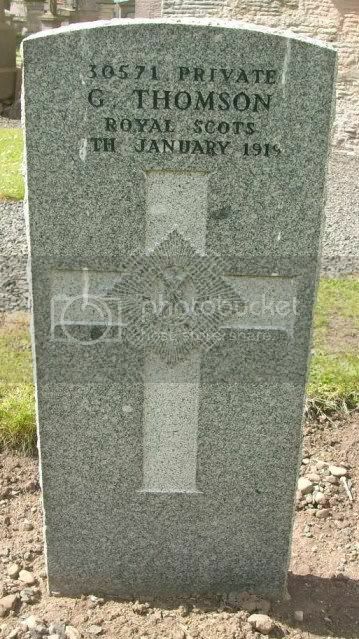 Additional information: Son of Daniel and Helen Cameron, of Freeburn Hotel, Tomatin, Inverness-shire. 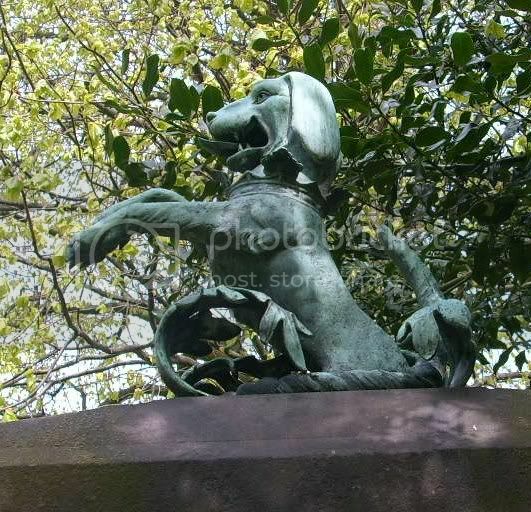 Native of Saltoun, East Lothian. Grave/Memorial Reference: I. A. 11. 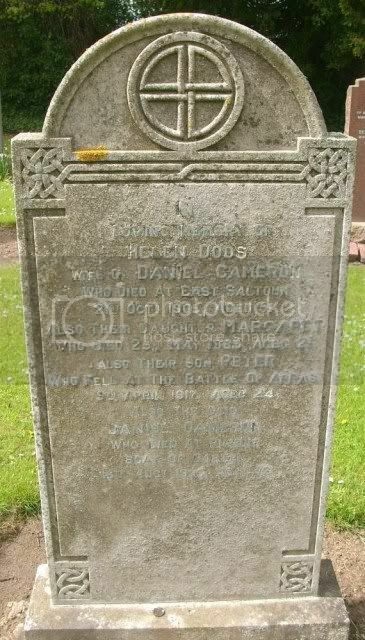 In loving memory of Helen Dods wife of Daniel Cameron who died at East Saltoun 21st Oct 1905 aged 51 also their daughter Margaret who died 25th May 1885 aged 2 1/2 also their son Peter who fell at the Battle of Arras 9th April 1917 aged 24 also the said Daniel Cameron who died at Pilmuir Boat of Garten 19th August 1926 aged 76. 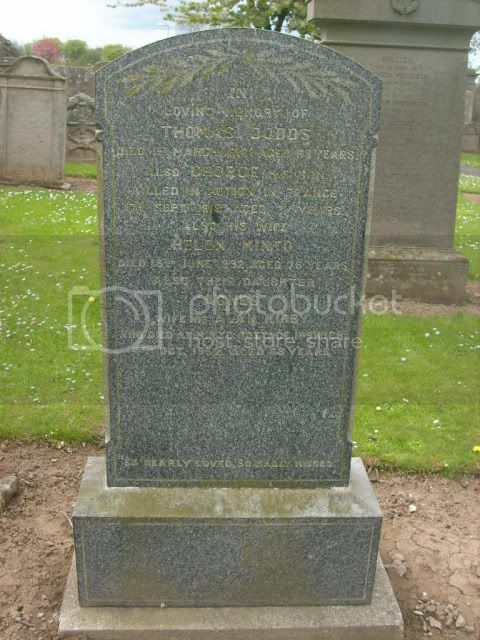 Additional information: Husband of Mary Dodds, of 396, Main St., Camelon, Falkirk, Stirlingshire. In loving memory of Thomas Dodds died 1st March 1918 aged 68 also George his son Killed in Action in France 17th September 1918 aged 27 also his wife Helen Minto died 16th June 1932 aged 76 also their daughter Agnes wife of Alan Kirby who died at Minto Cottage Ipswich 4th October 1952 aged 68. Additional information: Son of Mr. and Mrs. Milne, of Rathven, Buckie, Banffshire; husband of Agnes Symington Aitken Fordyce, of Glen-Kinchie, Pencaitland, Haddingtonshire. 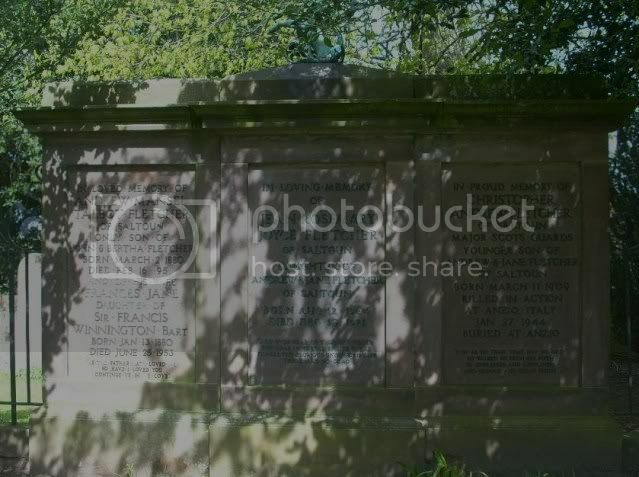 In loving memory of James Aitken died 14th Feb 1920 aged 78 his wife Isabella Park died 11th May 1911 aged 68 and their daughter Agnes died 7th Sept 1919 also of James Fordyce husband of the latter Killed in Action in France 27th August 1918. 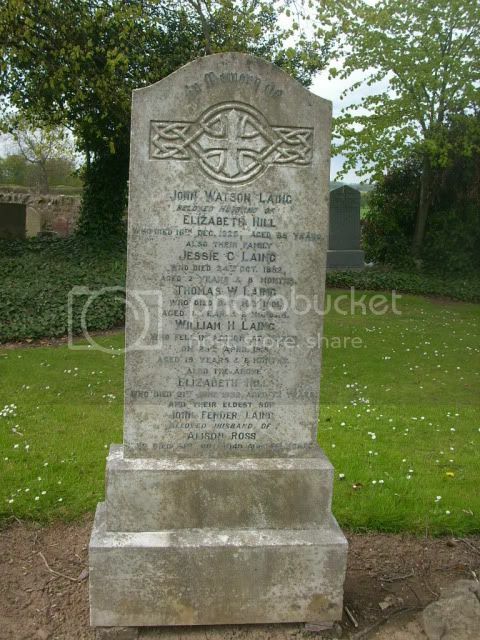 Additional information: Son of John and Elizabeth Laing, of East Saltoun, Pencaidand, Edinburgh. In memory of John Watson Laing beloved husband of Elizabeth Hill who died 16th December 1925 aged 65 also their family Jessie C Laing who died 24th October 1892 aged 2 years 8 months Thomas W Laing who died 24th May 1901 aged 1 year 8 months William H Laing who fell in action at Ypres on 23rd April 1915 aged 19 years 8 months also the above Elizabeth Hill who died 21st June 1932 aged 72 and their eldest son John Fender Laing beloved husband of Alison Ross who died 31st July 1949 aged 62. 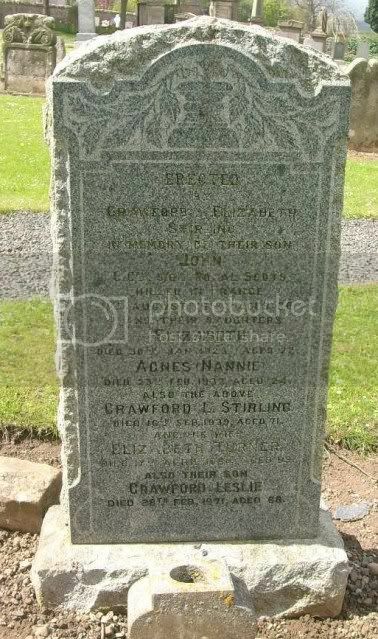 Additional information: Son of Crawford and Elizabeth L. Stirling, of Samuelston Mains, Pencaitland, Edinburgh. Grave/Memorial Reference: V. B. 34. Erected by Crawford and Elizabeth Stirling in memory of their son John L.Cpl 5/6th Royal Scots killed in France 11th August 1918 aged 20 and their daughters Elizabeth died 30th January 1923 aged 22, Agnes (Nannie) died 23rd Feb 1932 aged 24 also the above Crawford L Stirling died 16th Sept 1939 aged 71 and his wife Elizabeth Turner died 17th April 1964 aged 99 and their son Crawford Leslie died 28th Feb 1971 aged 68. 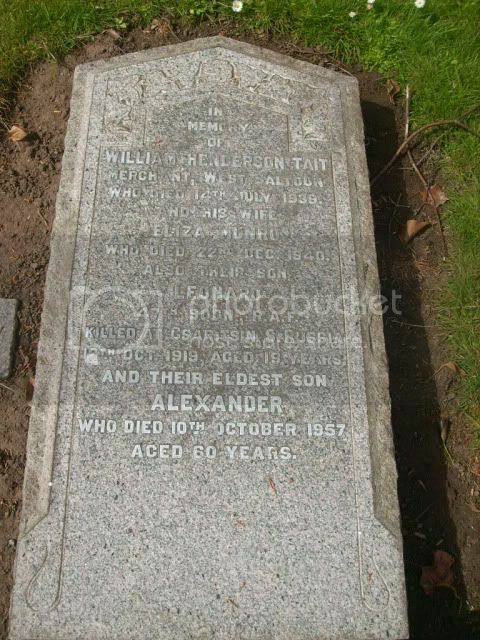 Additional information: Son of William and Eliza Tait, of West Saltoun, Pencartland, East Lothian. 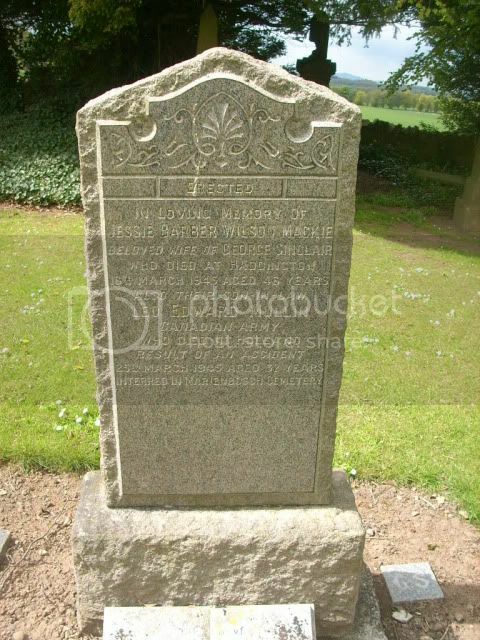 In memory of William Henderson tait, Merchant West Saltoun who died 14th July 1939 and his wife Eliza Munro who died 22nd Dec 1940 also their son Leonard 47th Sqdn RAF killed at Csaritsin S Russia 12th October 1919 aged 19 and their eldest son Alexander who died 10th Oct 1957 aged 60. Additional information: Son of Alexander Stewart Addison and Helen Jane Addison, of Saltoun, East Lothian. Grave/Memorial Reference: 6. A. 11. In loving memory of Alex. 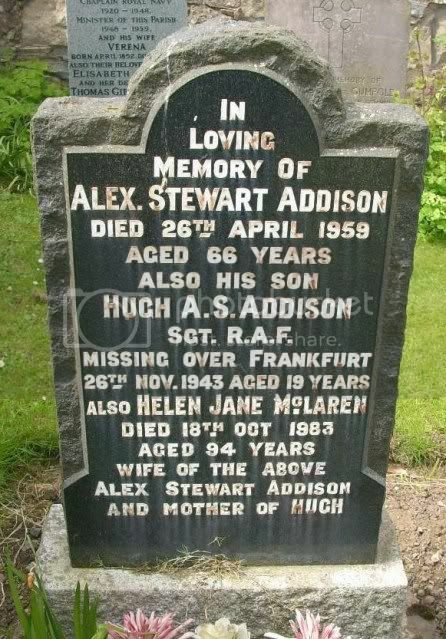 Stewart Addison died 26th April 1959 aged 66 also his son Hugh A. S. Addison Sgt RAF missing over Frankfurt 26th November 1943 aged 19 also Helen Jane McLaren died 18th October 1983 aged 94 wife of the above Alex Stewart Addison and mother of Hugh. Both father and son on this family stone were in the military, the son, Christopher Andrew Fletcher of Saltoun was a Major in the Scots Guards and was killed in action during WWII, his father, Andrew Mansel Talbot Fletcher of Saltoun died in 1951, he was a Captain in the 2nd Life Guards during the South African War and later he served with the Forage Department of the A.S.C during WWI. (Middle) In loving memory of Jean Rosemary Joyce Fletcher of Saltoun daughter of Andrew and Jane Fletcher of Saltoun born August 12th 1904 died December 10th 1921. 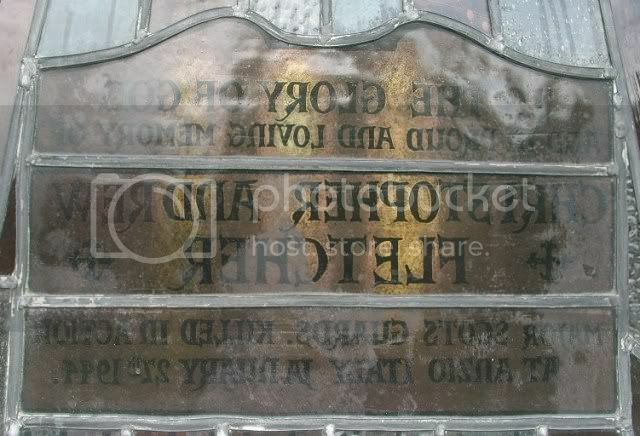 Additional information: Son of Andrew and Frances Jane Fletcher; husband of Jean Nina Fletcher. Grave/Memorial Reference: III, X, 12. (Right) In proud memory of Christopher Andrew Fletcher of Saltoun, Major Scots Guards younger son of Andrew and Jane Fletcher of Saltoun, born March 11th 1909 killed in action at Anzio Italy Jan 27th 1944, buried at Anzio. 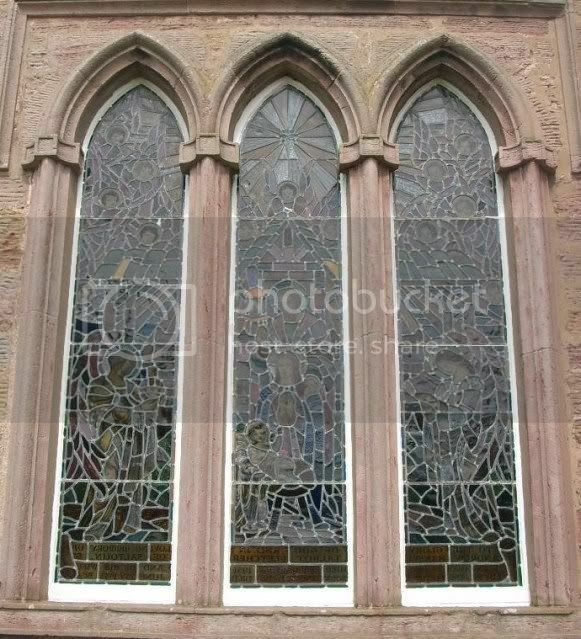 Memorial window in the East Aisle of the church. East Aisle; Stained Glass Window: "To the Glory of God and in proud and loving memory of Christopher Andrew Fletcher, Major in the Scots Guards, killed in action at Anzio, Italy, January 27th 1944." Christopher Andrew Fletcher born 1909 was the 2nd son of Andrew Mansel Talbot Fletcher and Frances Jane Winnington. 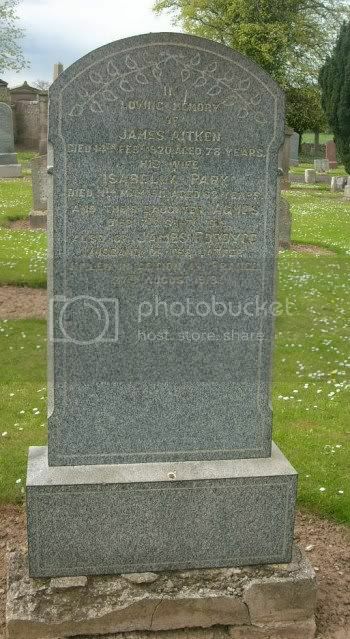 He married Jean Nina Kemble, daughter of Captain Horace Leonard Kemble M.V.O of Laggan Inverness in 1933. 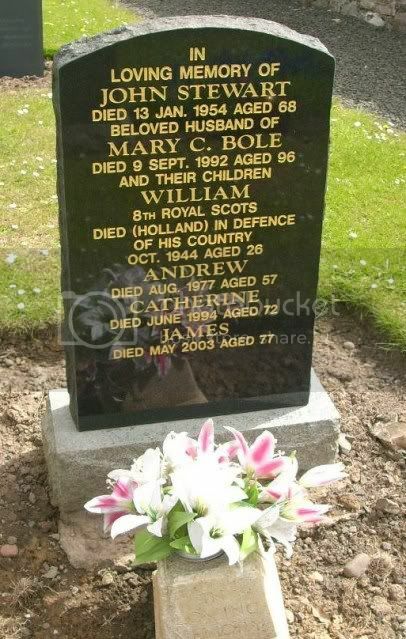 They had 2 children, Margaret Nina Fletcher born 1937 and Andrew David Talbot Fletcher born 1939. He married Angela Mary Rankin Gray, daughter of Robert Cyril Gray in 1967. 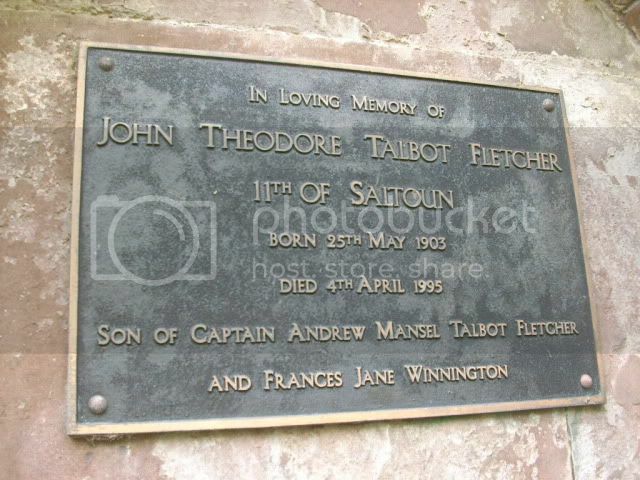 Captain Andrew Mansel Talbot Fletcher. (Left) In loved memory of Andrew Mansel Talbot Fletcher of Saltoun only son of John and Bertha Fletcher born March 2nd 1880 died February 16th 1951 and of his wife Frances Jane, daughter of Sir Francis Winnington. Bart. born January 13th 1880 died June 25th 1953. West Aisle; Stained Glass Window: "To the Glory of God and in loving memory of Andrew Mansel Talbot Fletcher of Saltoun, born March 2 1880, died February 16 1951, and of his wife Frances Jane Fletcher, born Jan 13 1880, died June 25 1953." 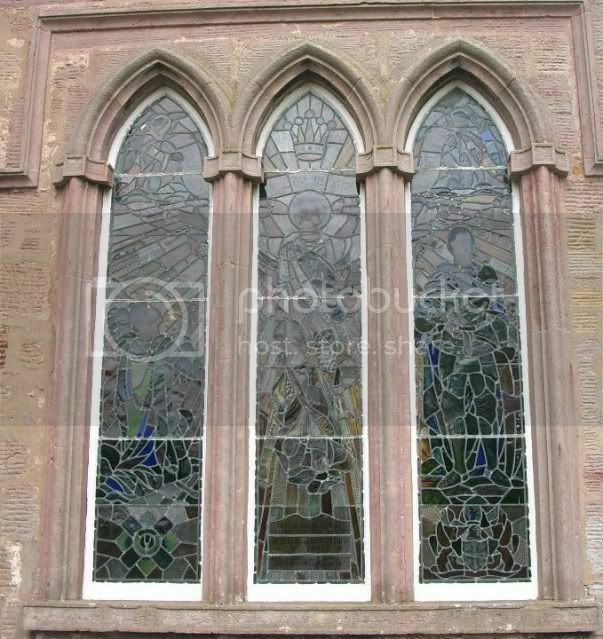 The memorial windows are on the left ( A M T Fletcher) and right (C A Fletcher) of the middle window. 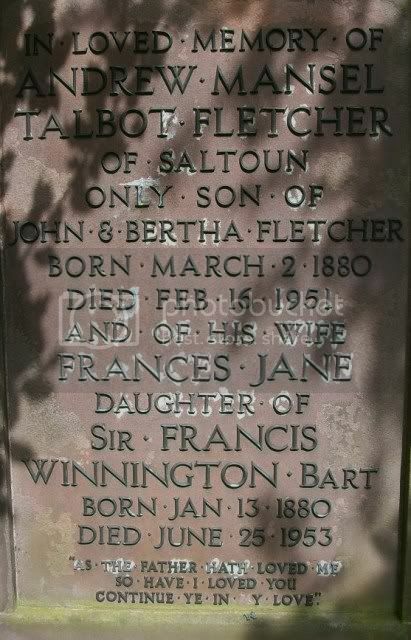 Andrew Mansel Talbot Fletcher was the only son of John Fletcher Fletcher (1827-1903) and Bertha Isabella Talbot of Saltoun Hall (1841-1913), they married in 1866. (They also had 8 daughters). Andrew Mansel Talbot Fletcher married in 1902 to Frances Jane Winnington (1880-1953), daughter of Sir Francis Salwey and Lady Winnington 5th. Bart. of Stanford Court Worcester, she was the grand-daughter of Lady Alfred Churchill and cousin of The Duke of Marlborough and Sir Winston Churchill. They had 2 sons and 2 daughtrers. John Theodore Talbot Fletcher (Jock) b 1903, who married in 1933 to Norah Gabbett-Mullenhan daughter of Marshall Gabbett-Mullenhan. Their marriage was annulled in 1937. He was educated at Eton and Cambridge and served in the Welsh Guards. He inherired Margam Castle in Wales in 1918 when his aunt, Emily Charlotte Talbot died. He died on 4th April 1995 aged 91 at 17 Theyden Place Epping of influenza and old age mulit-system failure. However there seems to be some mystery surrounding his death and what happened after. See http://www.smokescreen.org.uk/jttfletcher/index.htm for more information! This plaque is on the outside wall, to the right of the door, of the Fletcher Vault. The vault is directly opposite the family stone (above). Robert father of Andrew Fletcher 1626-1665. Katherine Bruce mother of Andrew Fletcher, died 1713. 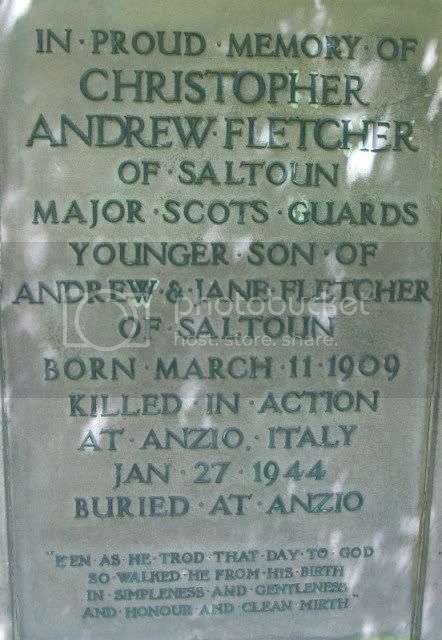 Andrew Fletcher Hic situs est Andreas Fletcher. Praediorvmsvll iorvm dominvs. Obiit Londini xv die septembris. [1653-1716]. John[husband of Charlotte] 7.2.1827 - 17.1.1903 aged 75. Bertha Isabella Talbot 15.9.1841 - 9.7.1913. Kathleen Louise, a fourth daughter of John, died 1922. Additional information: Son of Thomas and Rose Mullin; husband of Jane W. M. Mullin. Grave/Memorial Reference: XI. D. 10. Erected in loving memory of Jessie Barber Wilson Mackie beloved wife of George Sinclair who died at haddington 16th March 1945 aged 46 also their son-in-law Leo Edward Mullin Canadian army who died in Holland, result of an accident 25th March 1945 aged 32, interred in Marienbosh Cemetery. 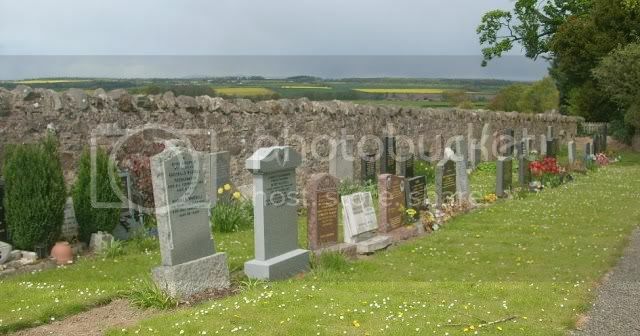 Additional information: Son of John and Mary Bole Stewart, of Gifford, East Lothian. Grave/Memorial Reference: II. G. 11. 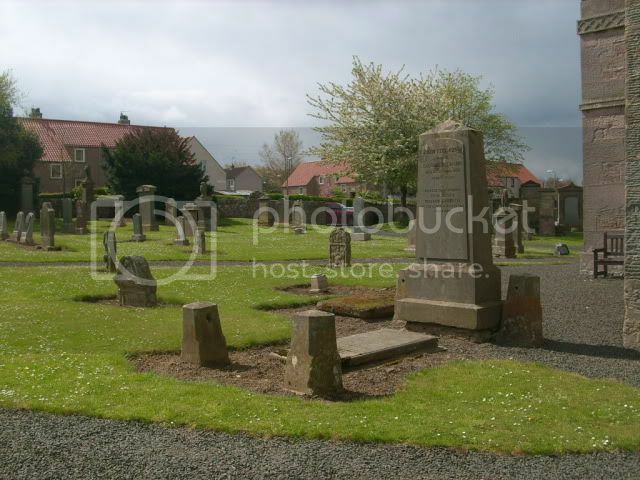 In loving memory of John Stewart died 13th January 1954 aged 68 beloved husband of Mary C Bole died 9th September 1992 aged 96 and their children, William 8th Royal Scots died (Holland) in defence of his Country October 1944 aged 26, andrew died August 1977 aged 57, Catherine died June 1994 aged 72, James died May 2003 aged 77. 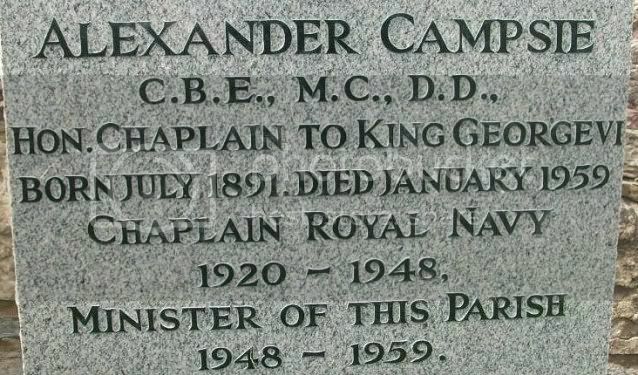 In loving memory of Alexander Campsie CBE, MC, DD, Hon Chaplain to King George VI, born july 1891 died January 1959. Chaplain Royal Navy 1920-1948. minister of the Parish 1948-1959 and his wife Verena born April 1892 died May 1979 also their beloved daughter Elisabeth 1919-2008 and her dear husband Thomas Gibson 1919-1970. Extract from St Andrews University Roll of Service 1914-1919. 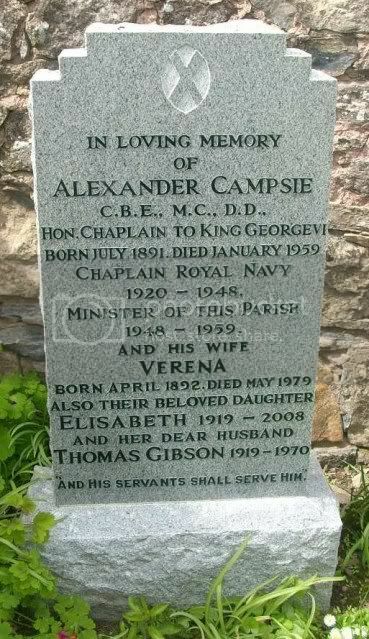 Campsie, Alexander M.A 1912 M.C Divinity Student New College Edin. Private RAMC, 2nd Lieut 8th Black Watch, Lieut in The New Armies. Employed by Ministry of National Service. Awarded the Military Cross for conspicuous gallantry in Action. He led bombing attacks and drove back the enemy at a critical time. He displayed great courage and determination throughout (10th Jan 1917). Alexander Campsie Temp 2nd Lt from 1st June 1915. Navy Chaplain website says he was a Chaplain for the Navy from 1920-1932. Unable at this time to find any information on him being a Chaplain to King George VI.